Book by 30/04/2019 for travel between 01/04/2019 and 31/10/2019 and receive 20.00% discount. Savour panoramic views from this top floor presidential suite featuring an extra spacious balcony and floor-to-ceiling windows. The suite offers one king-size bed and a large living room. Stretch out on the sofa and Watch your favorite show on one of the 3 LCD TVs. Stimulate your senses in the marble bathroom with relaxing whirlpool and in-bath TV. Special touches include a fluffy bathrobe, fruit and mineral water. Hilton beach concession at Falésia Beach, 5 minutes away from the hotel. Accessible through free transfer shuttle . On-site Golf Simulator with PGA Golf Pro Assistance. Free putting-green area. Aquarela - Listen to the sound of the waterfalls as you sample delicacies from the Mediterranean Barbecue. Savor juicy fresh seafood and choose from a wide range of fresh salads. Sip a variety of fruit smoothies and cocktails whilst enjoying poolside views at the Hilton Vilamoura As Cascatas Golf Resort & Spa. Please note Aqaurela has a seasonal operation from April to October. Cilantro - Coriander, with its unique properties, has given Chef André Simões inspiration. Using strong Italian Flavours along with the essence of the Algarve, the result is a delicious sensory experience. Hold a function in the private area, which seats 16 people. Please note that Cilantro Restaurant is open seasonally, subject to demand. Please call the hotel in advance for opening times and availability. Club H20 - Treat yourself to a delicious cocktail and a light meal in the Club H20. Enjoy a refreshing Piña Colada and tapas at the beach. Don’t miss out on the Sunset Lounge Parties every Tuesday, Thursday and Saturday. Moscada - Relax with a fresh juice in the morning sunshine and savour your Breakfast on the terrace. Admire the waterfall as you enjoy both indoor and alfresco dining at Moscada in the Hilton Vilamoura As Cascatas Resort. Rubi Bar - Watch sporting events on the TV from the comfort of a luxurious leather chair in the refined Rubi Bar at the Hilton Vilamoura As Cascatas Resort. Choose from a selection of spirits and port wines and snack on Hilton Classics, tapas or montaditos. Sip a cocktail later as you dance the night away to live music. Room Service - Enjoy a selection of dishes and experience an intimate 5 star meal from our 24-hour Room Service in the comfort of your own room. Enjoy a game at the prestigious Pinhal Golf Course. Located within Vilamoura – Europe’s largest private tourism resort – the course offers magnificent sea views and a rolling landscape of lush green fairways. The first nine holes meander over the fairway under a canopy of Umbrella Pines and carefully placed bunkers dot the course with a handful of water hazards providing the challenge seasoned golfers will appreciate. The back nine returns gently uphill, opening up to rewarding views over azure waters and the Atlantic. Pinhal Golf Course also enjoys the privilege of being in close proximity to the natural attractions and amenities for which the local area is revered. After an exhilarating round on the fairways, take an exploratory stroll through the tree-lined avenues of Vilamoura before choosing from one of the many eateries serving outstanding, locally-sourced fare. Children aged between four and twelve can enjoy Paradise Island, which features a daily schedule of children’s activities, games and entertainment to keep the little ones occupied. During July and August, the Paradise Island features Theme Days where children can become a princess or a pirate on the “Famous Characters Day”; decorate a pot and plant flower seeds on the “Gardening Day”; or simply have some fun dancing and doing sports on a “Keep it fit Day”! Older children will enjoy activities at the Teenagers’ Arcade during the summer, with cinema evenings and many games to play. The Vilamoura complex farther west is reputedly the biggest private holiday development in Portugal and perhaps the whole of Europe. Amid quality hotels and apartments, this is a holiday playground offering a large marina, a choice of three golf courses and a wide range of other sport facilities. The Roman gentry liked it here, too. You can visit the site of a first-century nobleman's villa. Outside of the individual holiday resorts within the overall complex, the heart of the matter is really the beaches and marina. There are many restaurants and bars on or near the marina quayside. 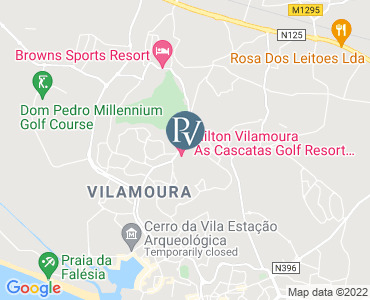 Nearby, you can try your luck at the Vilamoura Casino. The cavernous casino features a nightly floor show. For film buffs there's a comfortable cinema with English-language films.